What’s the Best Source of Omega 3 Fatty Acids for a Vegetarian or Vegan Diet? Until recently, almost all official vegan and vegetarian societies recommended ALA, or alpha linoleic acid, as the classic source of omega three fatty acid for vegetarians. While ALA is a great fatty acid to ingest, it is then up to the human body to convert it into the longer chain form that offers the optimum health benefits. Since the body is not hugely efficient at this conversion process it means that vegetarians have generally fared less well than fish eaters in their essential fatty acid levels. Don’t forget these acids are called ‘essential’ for a reason – the body needs them to achieve good health. Why Algae is the Best Source of Vegetarian and Vegan Omega 3? Fortunately, recent advances in nutrition have bought marine algae products to the market such as phytoplankton. These offer superb forms of long chain omega-3 that are completely vegan! 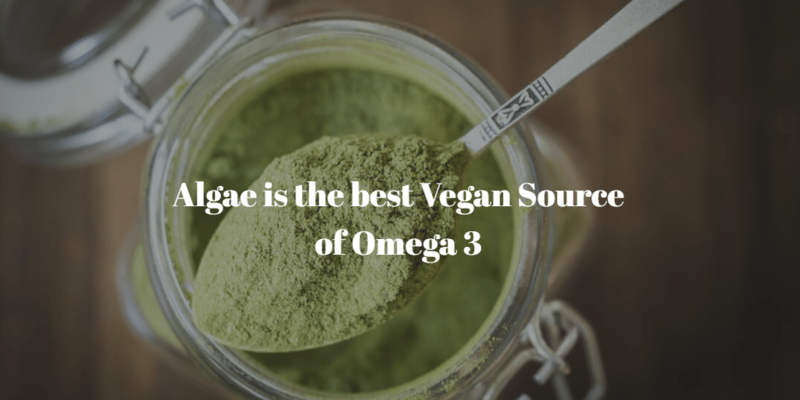 Although currently a relatively small market, we’re confident that algae is going to become the preeminent source of healthy Omega 3 within a few years. When the body absorbs the shorter chain versions such as found in ALA, it has to convert them first into the longer chain for it to be used in the body. This is where Algal Oil really shines, since it offers long tail Omega 3 which needn’t be converted. (1) Algae Oil – Algae offers a sustainble, long chain form of Omega 3. The average dose differs from brand to brand but is roughly 1000mg EPA + DHA per teaspoon. (2) Marine Phytoplankton -This is the wholefood source from which most algae oil is extracted. Taking the powder is less concentrated than the pure oil capsules but the powder has a host of other benefits as well. (4) Linseed (also known as Flax) has the benefit of containing lignan, an important phytonutrient with cancer preventing properties (ref). (6) Hemp Seeds With a 1 to 4 ratio of Omega 3 to 6, Hemp is a superb food to ingest, boasting a massive antioxidant content in addition to it’s EFA’s. One tablespoon of hemp oil per day exceeds the FDA’s recommended dose of Omega. (7) Spirulina – Spirulina rocks. This fantastic superfood contains 58mg Omega 3, 88mg Omega 6 per tablespoon. Algae offers all the benefits of fish oil, with the risk of heavy toxicity. For vegans and vegetarians it also means a superior form of essential fatty acids to things like Flax seed, which need to be converted by the body from the shorter chain to longer chain EPA. Importantly, it also means you no longer have to support fishing practices which are damaging the health of our oceans. Our algae is produced inland in a closed loop bioreactor, meaning it has no impact on native algae populations or the fish that feed off them. Is Vegetarian and Vegan Omega 3 Effective? The answer to this is a definitive yes! Until now, veggies have relied on plants like linseed (flaxseed) which offers alpha-linoleic acid (ALA). The body can convert this into the EPA it needs, but poorly. By taking an algae supplement, you get everything you need in a bioavailable form. Should I be looking for EPA or DHA? Both EPA (eicosapentaenoic acid) and DHA ((docosahexaenoic acid)) are forms of Omega 3 fatty acid. Both of them have valuable properties but which one you look for in particular will vary dependent on your age, gender, life situation and so forth. Both of these oils are worth including your diet via a wide source of naturally occurring food sources or sustainably produced and bio available supplementation. How Much Vegetarian or Vegan EPA and DHA Should I take Daily? How Much Vegetarian Omega 3 Should I take during Pregnancy? Essential for the neuro-development of the foetus, vegetarian omega 3 supplements also contribute to birth weight and a normal gestation period. These days, however, pregnant women are limited their dietary intakes of fish – the traditional source of EFA – due to potential heavy metal toxicity. Recommended levels of dietary Omega 3 during pregnancy is 600mg of which 300g is DHA (ref). Is Vegetarian Omega 3 Supplementation Appropriate for Dogs? Absolutely. Many concerned dog owners keep their pets off fish oil for the same toxicity concerns, and in this case the question is what’s the best alternative? We’re confident that Algal Oil offers a product of comparative nutritional power to the best cold water fish oil and of course you can rest assured knowing it has minimal environmental impact, due to it’s production in a bioreactor.